Manager Keith Curle has challenged Carlisle United to win their last five games, ensuring they are involved in the League Two promotion mix. The Cumbrians were beaten 2-1 by play-off outsiders Mansfield on Saturday, a result that leaves them 10th and two points off the top seven. It was the second defeat in three games for Curle's side. 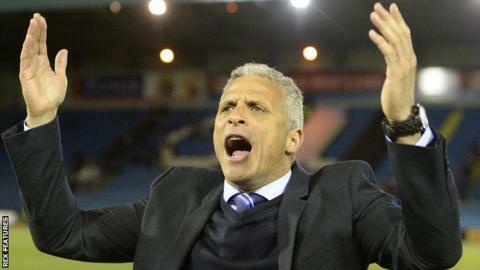 "To be successful you are going to get pressure, the players have to handle that," Curle told BBC Radio Cumbria. "Don't get off the bus now, we're still there. We've got five games left, can we get five wins?" Carlisle remain in the pack but draws, of which there were four in a row in March, have stifled their bid. Home wins against Bristol Rovers and Hartlepool preceded Saturday's loss, but results elsewhere leave the table looking congested with four teams all on 62 points. "There's a level of frustration from myself, I want to win games comfortably, 2-0 or 3-0, so we're bouncing," Curle added. "It's a nervy time for these players, but I remember there was a nervy time last season when we were at the wrong end of the table. People were saying we were down then, but we didn't go down."